For the past six months I have been very focused on organizing my online activities, deactivating accounts that I never use, selling off domain names that I’m never going to develop, and unsubscribing from the many email newsletters that haven’t served me well for a very long time. Let me tell you – it feels great! But one newsletter I always look forward to receiving is from the GoodNewsNetwork.org website which provides the latest summary of – you guessed it – good news from around the world! Although this article “Family Dinners Nourish Teens’ Happiness: Study” isn’t about home organization per se, it does tie in to the fact that family dynamics are directly impacted by the flow and the order of your home. Regular family suppers contribute to good mental health in adolescents, according to a study co-authored by McGill University professor Frank Elgar. Despite the fact that teens may squirm under the barrage of parental questioning, there are benefits to these family meals — regardless of whether or not they can easily talk to their parents. 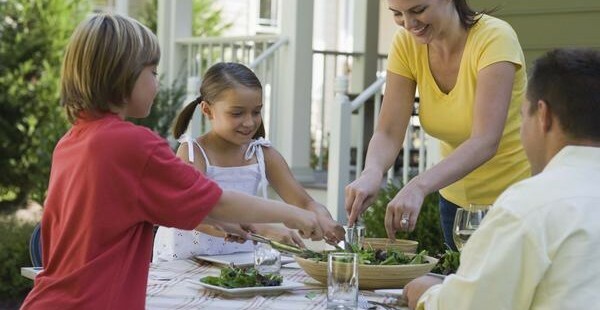 “More frequent family dinners related to fewer emotional and behavioral problems, greater emotional well-being, more trusting and helpful behaviors towards others and higher life satisfaction,” says Elgar, an associate professor in the Faculty of Medicine’s Department of Psychiatry, whose research centers on social inequalities in health and family influences on child mental health. Using a national sample of 26,069 adolescents aged 11 to 15 years, the study examined the relation between frequency of family dinners and positive and negative aspects of mental health. The researchers found the same positive effects of family meal time on the mental health of the young subjects, regardless of gender, age or family affluence. During the study, the adolescents submitted data on the weekly frequency of family dinners, ease of parent-adolescent communication and five dimensions of mental health, including internalizing and externalizing problems, emotional well-being, more helpful behaviors and life satisfaction. The authors suggest that family mealtimes are opportunities for open family interactions which present teaching opportunities for parents to shape coping and positive health behaviors such as good nutritional choices, as well as enable adolescents to express concerns and feel valued, all elements that are conducive to good mental health in adolescents. The results of this research are published in the Journal of Adolescent Health. The Canadian Health Behaviour in School-Aged Children study was part of a World Health Organization collaboration of 43 countries and was funded by the Public Health Agency of Canada.